you must learn how to communicate at the cellular level. Otherwise, you are doomed to remain stuck in negative patterns. Amazing new tools make it possible for you to literally program success into every cell of your body! When I came across these stories, I immediately knew I had to share them with you. I think you’ll be moved and impressed. In Great Britain, a young boy astounds the medical community by almost completely reversing the physical effects of a congenital disease for which there is no known cure — without pharmaceuticals of any kind. In Brazil, a film crew captures astonishing footage of a local healer performing successful life-saving surgery, inflicting no pain on the patient, though the healer cut a large incision and used no anesthetic. These incredible stories are evidence of The BIOLOGY OF EMPOWERMENT. You see, beliefs create reality. If you want to change your life, then you must change your beliefs. But emerging research has revealed a critical catch in this universal truism - belief doesn't merely affect the body. It IS the body! We now know that every action of the mind - every thought, every emotion, every belief - transmits a measurable vibrational frequency. We also know that each cell in the human body is equipped with tens of thousands of exquisitely sensitive receptors that are designed to resonate with these frequencies. At the moment a belief is formed, it is communicated to and imprinted on each of your cells through this process. Your cells are compelling you toward very specific situations and outcomes - often in direct opposition to your conscious and even subconscious intentions! To truly, permanently change your life for the better, you must learn how to communicate at the cellular level. Otherwise, you are doomed to remain stuck in negative patterns. The good news is, you CAN achieve this deep level of change. Cellular communication is not only possible, but remarkably easy! The secret lies in a collection of amazingly powerful diagnostic and therapeutic tools that are easy to use and that ignite the processes of transformation instantaneously. In a moment, I'll tell you exactly what those tools are. But before you can understand why they are so incredibly effective at transforming core beliefs, you must understand how those beliefs are created in the first place. You probably know that the brain produces four different electrical signatures, or "waves." These patterns are known as Delta, Theta, Alpha, and Beta. Delta is the brainwave pattern of sleeping adults as well as infants. The next brainwave state, Theta, is what you experience in those fragile moments just before you fall asleep and just as you're waking up. That's when you are most creative, most imaginative and discover your best ideas. Yet children between the ages of two and six are in an almost constant Theta pattern. That explains the rich imagination, creativity, and fantasy life that characterize this age range. From Theta, the brain moves up to the Alpha wave pattern, the state you experience when you're relaxed, meditating, or daydreaming. From the ages of six to 12, children's brains operate in a near-constant Alpha state. Beta is the ordinary, fully awake and functioning adult brain state you are in right now. We move into this brain state at about 12 years of age, and it remains our regular waking brain posture for the rest of our lives. Alpha-Theta, the brain states that children function in between two and 12, are also the states in which the mind is most open and susceptible to influence and suggestion. Those are also the years during which most of our beliefs are formed and solidified! Beliefs about marriage, family, money, God, love, learning, school, work, and "truths" about our own self-image ("You're so cute/smart/difficult/bad" etc.) - these are all created in childhood, based on what we see, experience, and are told by parents, teachers, the wider culture, and other influential forces. Does this mean what you think it does? Yes! All of us are effectively "hypnotized" into certain belief patterns that we then carry with us for the rest of our lives, for better or worse. Once the brain moves into adulthood's Beta frequency, the programming installed during childhood remains operational at the cellular level, locked in and unaffected by the workings of the conscious mind. Renowned clinical psychologist and bestselling author Dr. Lee Pulos calls these childhood-based patterns "belief trances." They dictate your decisions, direct your actions, and determine each and every outcome in your life: successes and failures, triumphs and frustrations, love and letdowns. Dr. Pulos has spent his distinguished career identifying the most effective cutting-edge strategies for personal transformation available, and then helping thousands of clients - including top CEOs and professional athletes - to apply those strategies for maximum, lasting success. In his audio program The Biology of Empowerment, Dr. Pulos distills decades of research in the fields of human physiology and quantum physics (including groundbreaking NEW findings) into an extraordinary set of tools that will enable you to quickly identify and then change - at the conscious, subconscious, AND cellular level - the belief patterns that are holding you back from growth, change, and total personal success. Yes, I want to program success into every cell of my body and experience rapid, lasting change. An amazing tool for communicating with the deeper levels of your subconscious while remaining in a conscious, fully awake state, the Ideomotor can be used inconspicuously in any situation. It will empower you to quickly identify self-sabotaging behaviors and assess true unexpected inner feelings and surprising motivations that lie beyond the reach of your Beta mind. Also phenomenally effective at locating lost and misplaced items! Quick, easy, and extraordinarily powerful, Applied Kinesiology (also known as muscle testing) opens up a direct line of communication with your physical body, giving an actual, understandable "voice" to your cellular structure. This extremely simple procedure is outlined in detail in The Biology of Empowerment. Not only will it yield clear and instantaneous information about your limiting core beliefs, but you can also use this tool to discover things like what foods are good and bad for you, which chemicals and products you should avoid to maintain good health, and much more. Excellent for identifying the root causes of fears and revealing the hidden roadblocks to success, this brief procedure is ideally practiced at night, in the moments before falling asleep. By following the simple step-by-step imagery procedure you'll discover in The Biology of Empowerment, you can receive a vivid answer to any question you ask ... in just seconds! One of the oldest diagnostic techniques available - and, when it is done properly, one of the easiest and most accurate - the Pendulum has been used for thousands of years in many different cultures to access the Universal Mind and predict future events, divine truth, retrieve information at a distance, and receive answers to critical questions. In The Biology of Empowerment, you'll learn exactly what a Pendulum is and how to use it to identify the core beliefs that are limiting your success, including precisely how and where to position the Pendulum for optimal reading ... the specific phrasing you should use to get the most clear and accurate answers ... which questions you should NOT ask when using the Pendulum, and why. Using these techniques, you will uncover the precise thoughts, beliefs, and memories that are negatively impacting your ability to reach specific goals in your life today. Very simple, astonishingly effective, the Emotional Freedom Technique, or EFT, has been called one of the "Power Therapies of the New Millennium." Limiting beliefs become encoded in your body's electrical system, stalling the flow of energy and resulting in anxiety, stress, phobias, poor health, sleep disorders, attention deficit, and a host of other problems. By focusing on a specific limiting belief and then tapping each of 12 points on your body in a precise manner and sequence, EFT enables you to instantly recalibrate energy flow and effectively "rewrite" the messages between your brain and your body, installing whole new belief patterns at the cellular level and alleviating the physical, psychological, and emotional effects of the previous patterns. You will experience IMMEDIATE results! Right now, at this very moment, you are laying the groundwork for your future - generating vibrational frequencies that project forward in time and then work to draw you down a very specific path. The Full Brain Programming Technique puts this process under your conscious control. Consisting of 30-second programming "bytes" that can be practiced anywhere, this technique empowers you to create new neurological grooves and energetic pathways that will carry you to the specific future outcomes of your choosing. Once these pathways are established, achievement becomes inevitable. This particular technique is especially prized by many of the world-class athletes Dr. Pulos has worked with, who use it to ensure peak performance, high scoring, and winning outcomes - with consistent success. Do you find that memories of past negative experiences and events - bad job interviews, bad dates, "losing" moments - have an influence on how you think and act today? In just TWO SECONDS, this remarkable technique can neurologically redefine any past negative experience, transforming it into an engine for growth and success. Plus "The Garden," the "Tonal Manifestation Technique," and more! In addition to the 12 audio sessions, The Biology of Empowerment includes a comprehensive workbook that outlines each tool in detail: exactly what it does, and exactly how to use it to get the maximum benefit from these potent catalysts for personal transformation. As a very special bonus, Dr. Pulos has included his renowned Deep Trance Identification Technique in The Biology of Empowerment. This incredible guided session, on two CDs, takes you into a hypnotic state in which you identify, on a deep cellular level, with someone who possesses the exact skills, characteristics, or qualities you want to possess. In this highly accessible posture, your mind/body is able to replicate the "memory" of these characteristics. Permanent personal transformation is possible ... and it all starts at a cellular level. Order The Biology of Empowerment today, and equip yourself with the most powerful tools ever discovered for creating rapid, lasting changes that will naturally propel you toward wealth, health, happiness, or any goal you can think of! P.S. The remarkable people I mentioned at the top of this letter are all real, and their TRUE stories demonstrate what amazing things can happen when we remove the limitations we place on our minds and suspend judgment about what we can and cannot accomplish. The amazing tools and astounding information you'll find in The Biology of Empowerment will place you among the enlightened individuals who dwell on this higher plane of thinking and living. Meet Dr. Lee Pulos: A master educator on mental training to achieve peak performance. Dr. Lee Pulos is a leading authority on corporate and personal development, a stress-management counselor, and an astonishingly successful entrepreneur. A clinical psychologist who has worked with Olympic athletes and Team Canada, Dr. Pulos has conducted clinics for coaches throughout North America. He is also profiled on radio and television programs worldwide. "Program yourself to succeed at a cellular level..."
"The program is a must have for anyone who has read/listened to self-development programs for years, felt the power and energy of their own potential and success while reading; but found that this energy is soon lost once the book is finished. This program helps you hold on to that energy, by doing exactly as it says it will, programming yourself to succeed at a cellular level. Buy and enjoy!" YES, I want to equip myself with the most powerful tools ever discovered for creating rapid, lasting changes in the areas of wealth, health, and happiness! 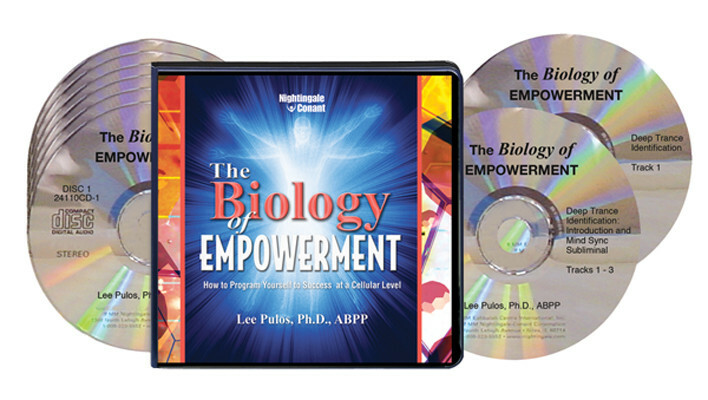 Please send me Dr. Lee Pulos' program The Biology of Empowerment, including the 6 CDs, 2 Bonus CDs, and Workbook on CD - for just $59.95 - which is $100 OFF the regular program price. Take advantage of this limited-time special discount now! If I am not able to program success into every cell of my body in the next 30 days, I can simply return the program in the next 30 days for a full refund. No questions asked.